Do you know a veteran looking for a home? We can help. 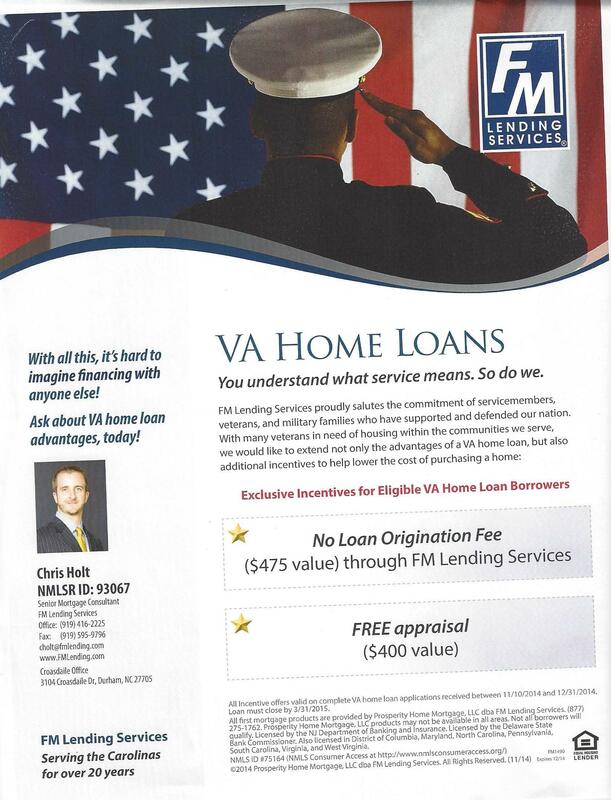 FM Lending is offering an amazing incentive to help those who served and are VA eligible buy a home. Call me, I can provide details. Is Your Real Estate Agent Hurting or Helping You Sell Your Home? Is your real estate agent hurting or helping you? One of the most wonderful things about working as a REALTOR is the amazing tool that we have called the multiple listing service. This database of listed homes is designed to give REALTORS complete and accurate property information. It is no exaggeration that every day that I run across listings in Triangle Multiple Listing which are incomplete and out right wrong. Room sizes are a piece of information that is often left off a listing. Some agents simply think this information is not important. I disagree. Let’s suppose a buyer has a California king sized bed and a listing simply has 00 x00 as room dimensions for the master bedroom. Will the bed fit? Who knows but the risk run is that buyer’s agents will pass the listing by because taking the time to email or phone for information that should have been entered to begin with is a waste of time and rewards a listing agent for bad, negligent and careless behavior. A second example of missing or incomplete information is tax data. Listing agents will use old tax rate; Durham’s tax rate last year was $1.29 per $100 of value; this year it’s $1.36. So let’s look at a home that’s has a tax value of $100,000. Last year taxes would have run $1290, this year $1360. A good buyer’s agent would pick this mistake or error up; but a great listing agent would have ensured the information was correct. Believe it or not, in these days of tight lending standards this $70 difference could disqualify a buyer from buying a home. Can you imagine finding this out a week before settlement? Talk about a recipe for disaster. The sad fact in all of this is that most owners won’t know if their agent is leaving important information out of multiple listing and is indeed hurting their chances of a sale. My suggestion is that home sellers hire agents who will be detail oriented and those owners ask to review the information that their agent is entering into the multiple listing system on their behalf and if the information is missing or wrong; demand correction or fire the agent. Straight talk on real estate commission splits…is your agent hurting you? Did you know that how your agent divides the commission that you pay to sell your home can hurt you and you might never know it? Let’s face it a 6% commission is a lot of money. It is customary in the Raleigh/Durham greater Triangle real estate market that the commission you pay as a seller to sell your home is divided between listing agents and buyer’s agents. Many times the split is a simple 50/50 split, 3% to the buyer side and 3% to the listing side. After all without a buyer there would be no sale and certainly no commission. Other times it isn’t a simple split; and that’s where you a seller can be hurt. Agents are required to disclose to sellers how the seller paid commission will be split, but disclosure as we all know doesn’t always mean explanation with respect to consequences. For example let’s say the a couple lists their home for sale; and let’s suppose that the sale of their home is going to be a short sale, the seller owes more on their mortgage than is supported by current market conditions. Their agent takes the listing, knowing and disclosing the short sale and he markets the property in multiple listing with a 2.5% commission payout. He is retaining 3.5% because he’s going to have to work hard. His listing agreement notes the commissions split but the agent doesn’t explain the consequences of the split to the seller. The listing agent doesn’t explain to his clients that although they aren’t “supposed to consider” commission payouts when searching multiple listing, buyer agents are only human and to expect them not to consider payment for work is naïve. So many times when competing with a 3% paid commission against 2.5% or 2.4% commission paid, a buyer agent might be overlook the properties paying less. In the case of the sellers mentioned above with their short sale perhaps this was the case. The property was aggressively priced but only after a series of price drops but still it languished on market. So long that the bank began foreclosure proceedings because the owners had stopped paying their mortgage. Ultimately the home did sell and close but it did so after about six months. Perhaps the listing agent could have expedited the sale of the home; which he is required to do, had he explained the consequences of his actions with respect to commissions paid. Did he? I doubt it because why would any seller risk foreclosure when they could avoid such drastic measures. My advice to sellers and buyers alike, ask questions. Ask your agent if how they divide YOUR money is going to hurt you or benefit you. You have a right to know.